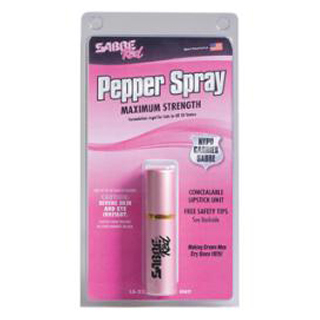 The Sabre Red Pink Lipstick Pepper Spray is compact attractive pink and more modernlooking than traditional pepper spray. The perfect addition to anyones purse this model is a practical and preferred way for many to carry their pepper spray. It is Police strength and reliable 1 brand trusted by police worldwide. It provides greater protection at a safe distance 10 bursts at up to 10 feet away. It has an extended 4year shelf life and it reduces wind blowback thanks to the stream delivery pattern.